Keith Meacham’s 8-year-old daughter recently asked her a very good question about Women’s History Month (March, you know). In today’s post, Keith shares her answer – and what it means that her daughter asked. She finishes with some children’s book recommendations you’ll want to know about. From Keith: Maybe it’s because I have two young daughters at home who are just becoming aware of what it means to be a girl in the 21st century (with all the perils and promises that come with the territory). This year, more than ever, it seems that people are paying attention to Women’s History Month in new ways. Local museums have mounted exhibits honoring the contributions of women who shaped our artistic and historical heritage. Bookstores fill their front shelves with biographies of extraordinary women. The children’s section of the library has gone all out with a special display of picture books that celebrate girl power! All in a season when a certain pink knit hat made the cover of Time magazine, and millions of women came out across the globe to stand up for the rights of just about everyone. My daughter’s school has gotten fully in on the action. They’re reading stories during circle time about against-the-odds bravery of women such as Eleanor Roosevelt, Helen Keller, Anne Frank and one of my personal favorites, Amelia Earhart. When Maggie (age 8) brought home a book from the school library a few days ago about Rosa Parks, it seemed the perfect moment to talk with her about how lucky we are that women like Rosa Parks had come before us, whose courage and audacity blazed new trails for all women (and in the case of Rosa Parks, all people). At first, my daughter’s question made me feel as though I’d been exposed: a failed female role model. Where had I fallen down on the job? Wasn’t I the person most responsible for telling her the stories of women who had fought for the right to vote? Wasn’t I supposed to explain to her that for centuries, being a girl meant certain doors were closed to you, no matter how bright, passionate or talented you were? As I searched feebly for a response to her very good question, it occurred to me that my daughter’s question was really a sign of how far girls have come, of how confident girls feel in their world, of how certain they are that they’ve got a fair shot. And why wouldn’t they? My daughter knows moms who work and moms who stay at home to focus on their families. She’s watched her own mom do both (“you can have it all but not at the same time,” a wise friend once said to me). Girls can run for president. Girls can be ballerinas, but they can also be basketball stars. While she’s still young and may encounter hurdles along the way because she’s a girl, she doesn’t see herself as someone who requires a special month of celebration any more than her brother does. Every day is a day for girls, as far as she’s concerned. My daughter’s privilege and good fortune in having so many healthy female role models means it will be doubly important for me, as her mother, to talk to her about the sacrifices made by the many women who came before her. It’s up to me to be sure she’s aware that women in some countries suffer unimaginable persecution. It’s also up to me to delight in her sense of herself as a person who can do anything. For that matter, it’s up to me to do the same for my son. So what are we planning to do – as a family of two parents, two girls and a boy – to celebrate Women’s History Month? We’ll choose a few books about trailblazing women who’ve made our world a better place, but we’ll also find some time for a funny story or two about our favorite heroines, the spunky, neurotic, iconoclastic, wacky ones who remind us there are many ways to go about being a girl – and a human being. Keith is passionate about early reading. She’s Vice-President of Communications at Homer, the most comprehensive early reading platform of its kind: “Homer inverts traditional learn-to-read systems by beginning with the child’s particular interests and skill level rather than providing a one-size-fits-all approach to reading. We support parents and teachers by meeting children wherever they are on their reading journey.” Check in at LearnWithHomer for more, including a great blog. Excellent post by a most excellent role model and mama! Thanks for this post. As a father of three beautifully strong young women, this post reminds me that we must pause and consider the journey that women have traveled in the US and support those that are undertaking a challenging journey in other parts of the world. At Ravenscroft, we had the good fortune to have Cokie Roberts share her children’s book, Founding Mothers: Remembering the Ladies, a few years ago. Based on her bestseller Founding Mothers, this is a great read for young girls who have the right to dream and become exactly who they want to be. Keith, you certainly are a role model, and not only for your daughters. Maggie and Mary are lucky girls. One of our grand daughters is an Army Blackhawk helicopter pilot on duty in Jordan. “Shoot Like A Girl” is a book by Mary Hegar and recounts her experience as a Chopper pilot in Afghanistan and afterwards.Was reviewed in Tennessean Sunday. I plan on reading. Times and opportunities have changed dramatically for women in the past 50 years. One daughter an attorney and another a Dr., OBGY/N. Was very unusual when they entered college in Virginia, UVA and VCU. Keith, I love your post and what a great question! I love your insight and some of my favorite spunky girl books are on your list. Thanks! I was always a Nancy Drew fan! She had a great dad that treated her as an intelligent contributor – and that Ned! Well, he was not the center of her world – and they had a very respectful relationship. She was doing amazing work and with style – I imagine, if she were a teen today, Nancy would start her own non-profit dedicated to innocence projects, have a blog about solving cold cases where amateur sleuths could share information and a Pinterest page featuring stylish flats and pencil skirts. Keith, those first five books were staples of my daughter’s early years!! Now she’s 17. Your post encouraged me to dust them off and share them with the wonderful young sisters (ages 2 and 7) across the street. Keith, Wonderful post! 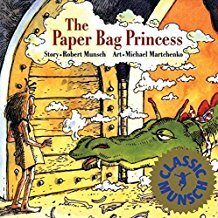 Paper Bag Princess is one of my favorites!